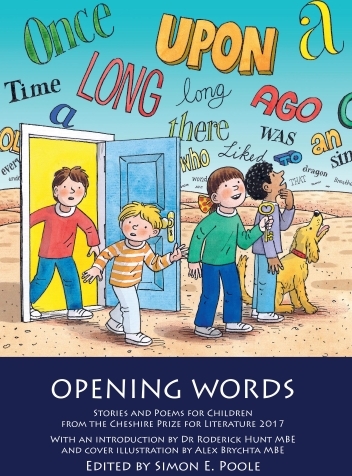 The stories and poems for children featured in this Opening Words anthology are nothing short of marvellous. The team of judges read a very wide-ranging selection of entries from the 2017 Cheshire Prize for Literature competition: absurd poetry; humorous poetry; and stories that engaged with fantasy writing; gritty realism; or many that were somehow in-between, dealing with multiple historic times or blurs of reality that were sometimes unsettling, sometimes hopeful. The stories and poems worked with so many different genres and styles too; there were remarkable examples containing adventure, heart-breaking loss, and even some with more than just a touch of magic about them. Indeed, having a touch of magic was perhaps the defining characteristic for all the entries selected for this year’s volume. Magic is often the key to an engaging text, and not always the intangible kind. This anthology offers something of that magic and the title itself alludes to the way that words can open up new worlds and ways of understanding. Every reader can explore this collection of creative writing and experience for themselves the new worlds created for children by these Cheshire Prize for Literature authors. Simon E. Poole (Editor), Opening Words: Stories and Poems for Children from the Cheshire Prize for Literature 2017 (with a cover illustration by Alex Brychta MBE and foreword by Dr Rod Hunt MBE), ISBN 978-1-908258-33-5, £10.99. The e-book (ISBN 978-1-908258-96-0) is currently available through Google Play, ebrary, EBL, EBSCO, Ebook Central, Gardners and Dawsonera.